I'll admit - I'm a redneck, hillbilly, hick, backwoods, name your label, girl - living a little closer to the "city" than I want, working in a job that I enjoy, that still involves a "cube farm". I'm a a hunter, gardener, and grew up farming. I suppose this is why my palate has matured into something that the supermarket just can't rise up to. I prefer my red meat to be venison, my pork to be raised by a local 4-H kid (though I'm still trying to find a wild pig to harvest), and I'll prefer my Thanksgiving turkey to be a wild bird that I've hunted. Why? It's not because I'm bloodthirsty, a blossoming serial killer, or a masochist. It's the flavor. The best cellophane packed $30/lb steak will still taste like 18 month old corn fed or grass fed beef....like the next one and the next one and the next one, times a few million. However, the venison I eat will taste different for each animal. If it's male it will be have a more musky flavor, if its older it will have a more complex combination of years of dietary changes. Sometimes there will be the tang of cedar, or maybe if I'm lucky enough to trade for some antelope or mule deer from out west, it's already "preseasoned" by a diet of sage. The diet is mild flavor, but the age often has a large impact on flavor - especially when comparing a young doe to an aged buck. What does this have to do with Dual Purpose Chickens? Generally, if you're on BYC, you know that raising your own Cornish Cross chickens will result in a much tastier bird than the cello-bird at the supermarket. Part of this is diet, part is other taste factors, mainly stress. But it DOES taste "better". However, one is still following the same time and type equation....same breed, same amount of time (approx 8-10 weeks, though some folks go longer or shorter). 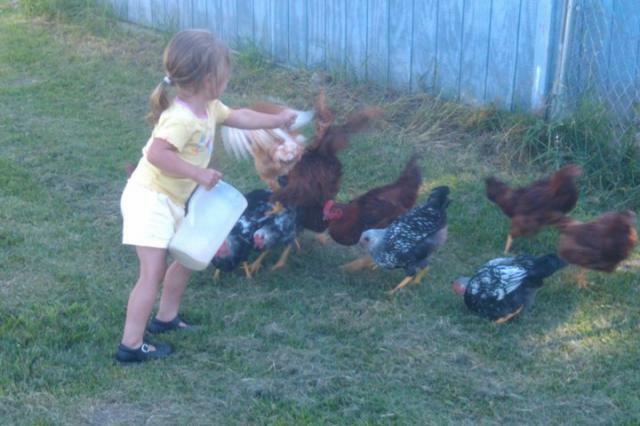 Some free range....well, MOST of BYC free ranges according to USDA terms - allowing access to the outside. Many get treats and a varied diet. All improves flavor. Now on to those Dual Purpose. Before the Cornish Cross "breed" took over, folks had just....chickens. Some were egg layers primarily, some put enough meat on their bones to be good for dinner AND for laying. All of them were good for eggs and meat. That's what chickens were for....eggs and meat. When it was dinner time, well, one could just go and grab whatever, whoever, and tada, dinner! The older a chicken got, the more it weighed. At the same time, just like an older deer developed a complexity of flavor, so did the chicken. The muscles - meat - developed more and more over time, and went from soft and easily cut to firm and dense. Back in the "olden days", this was known, and AOK. Cooking methods were altered to bring out the best in different ages of meat - hot and fast to make best use of the delicate flavor and soft meat of a young bird, or low heat and long cooking to bring out the maximum flavor and tenderize the older bird. Based on just general chickens, the qualifications for labelling type and cooking method were based mainly on age and weight...not just weight alone as it is today. The labels were "Broiler", "Fryer" and "Roaster"
Older than that, and it was called "stewing fowl", still delicious, but generally suited for soup, or crockpotting until done, then shredding for chicken salad, shredded BBQ chicken, or other chopped up chicken uses. Today, those three labels only mean weight in the market, and you don't see stewing fowl. Unfortunately, it's somewhat deceiving - for an 4lb supermarket chicken you can broil, fry or roast it, and it will pretty much have the same meat flavor - because it's all about 8 weeks old. It's never going to develop the complex flavor of a 6 months old chicken that is slow roasted in a dutch oven. Now, if you choose to go the Dual Purpose route, remember, this isn't your store chicken, this is your grandma's or great-grandma's chicken. You can't broil a 6 month old chicken and expect it to be tasty and tender. 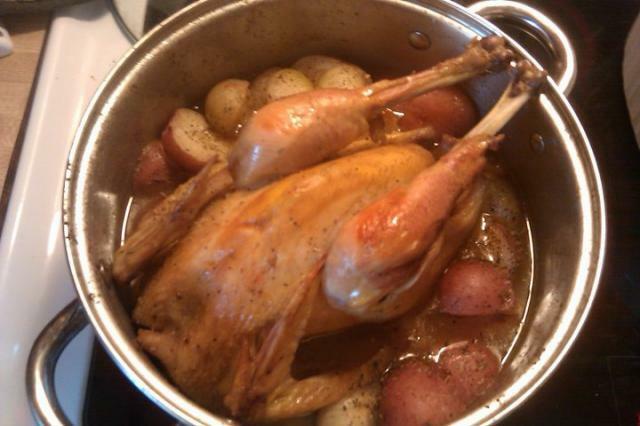 You can roast a young bird, but you won't have much meat on there to make it worth while. However, that 6 month old chicken will make the most delicious roast chicken with gravy (use those drippings!! ), and a young bird will be the star of the hot grill in the summer. Ask grandma for her old cookbooks or recipies for ways to bring out the deliciousness of your dual purpose birds...it's something you can't find in a store. Corning Cross - Super fast growing, BIG eaters, sensitive to weather and change. Prone to health problems over 8 weeks in age. Generally, they come in white, white and white.Do not reproduce well (do not breed well or produce chicks with the same qualities, they are technically hybrids). Dual purpose - Standard growth rate, moderate eaters - you can cut cost by feeding scraps and weeds, adaptable to climate and changes. Can live for years. Reproduce easily and produce chicks with the same qualities. Come in a unbeleiveable variety of colors and patters. Cornish Cross is the way to go if you are just looking to make meat, meat, and more meat - meat that tastes the same. That's why the supermarkets buy them, and large farms grow them. However, if you're looking to have a source of meat through the years, you'll have to keep buying chicks over and over again. Dual purpose however will live longer, are colorful, and still capable of putting dinner on the table. They are sustainable - as long as you don't eat ALL of your roosters, you can keep growing chicks for dinner and eggs down the road. You can make an initial investment of a few chickens, and not have to buy chicks or chickens again.